Once again it's time for some urban exploring. 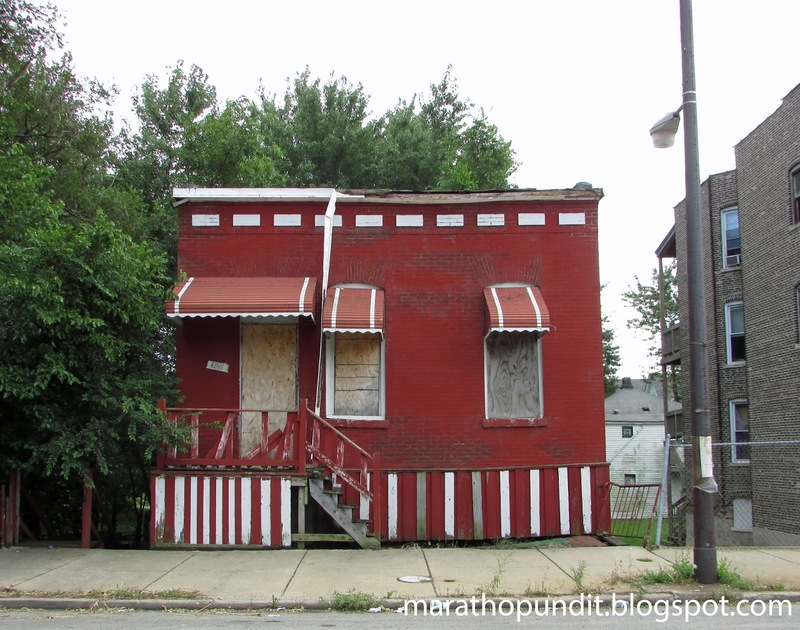 This time it's the South Chicago neighborhood which is on, you guessed it, Chicago's South Side. Over the last 30 days South Chicago is ranked 14th among Chicago's 77 neighborhoods in violent crime. My last abandoned homes entry began with a bridge and so does this one. And there's a family story that goes along with it too. My maternal grandfather, Richard H. Lucy, was a bridgetender for the city of Chicago. His final posting was here, the East 95th Street draw bridge over the Calumet River on the southern end of South Chicago. My father took me along once when he dropped Richard off at work in the late 1960s and I was able to spend a few minutes in the bridgetender's tower, which you'll see on the far side of the bridge. I didn't want to leave, and would have strongly protested had I known that it wouldn't be until 2016 that I would see this bridge again. More famously, early in the Blues Brothers movie, Elwood convinces Jake that their new Bluesmobile is a worthy vehicle for them as he drives the old police car over this bridge as it is elevating, despite the broken cigarette lighter in the dash. 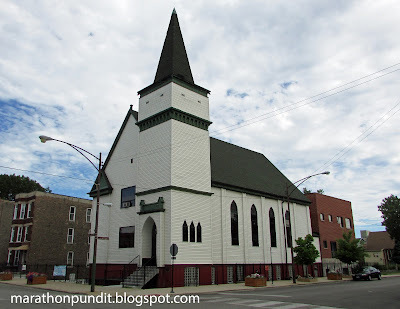 I drove past this church on 91st Street twice thinking that it was Triple Rock Baptist Church from the same movie, where, aided by James Brown's inspiring sermon, Jake and Elwood decide to go on their "mission from God," but then I thought I was suffering from a Blues Brothers delusion. Well, my first impression was the correct one, Pilgrim Baptist Church, not to be confused with the Louis Sullivan-designed house of worship in the Bronzeville neighborhood with the same name that was destroyed by fire in 2006, is that same church. The interior shots, however, were filmed in California. 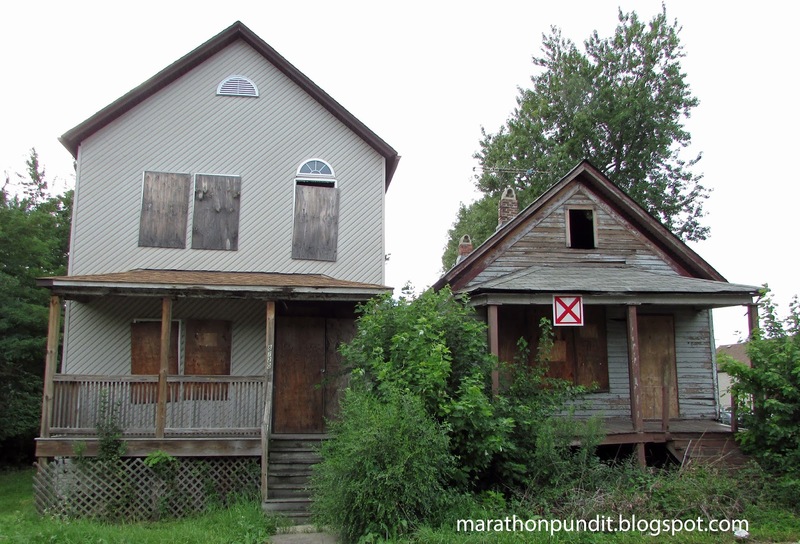 But where are the abandoned houses? 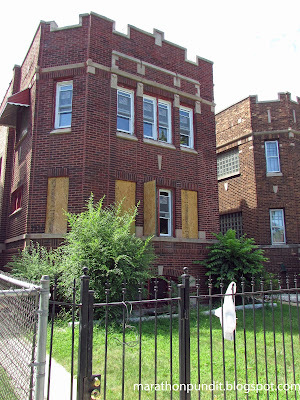 Here's one, at 3317 E. 91st Street. Chicago, and the rest of the country, needs more homes such as this one, albeit not abandoned. Simply designed but secure and sturdy. And cheap. In this section of South Chicago many of the streets are elevated, presumably for flood control. Around the corner on Mackinaw Street you'll find this vacated two flat. 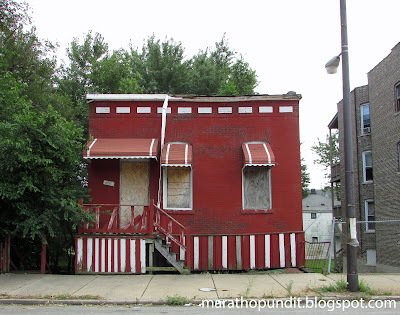 South Chicago was a separate village that was annexed to Chicago in 1889. US Steel's now-razed South Works, which opened in 1882, was the economic catalyst for the area, along with the other steel mills on the city's Southeast Side, for decades. At its peak in the 1940s South Works employed 20,000 people. The sprawling mill was shuttered in 1992. 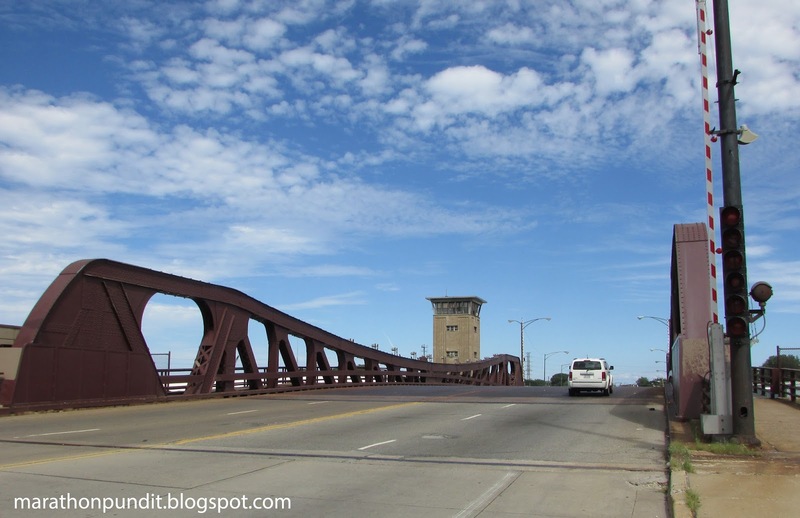 The borders of South Chicago are 79th Street on the north, Lake Michigan on the east, South Chicago Avenue on the west, and the Calumet River on the south. 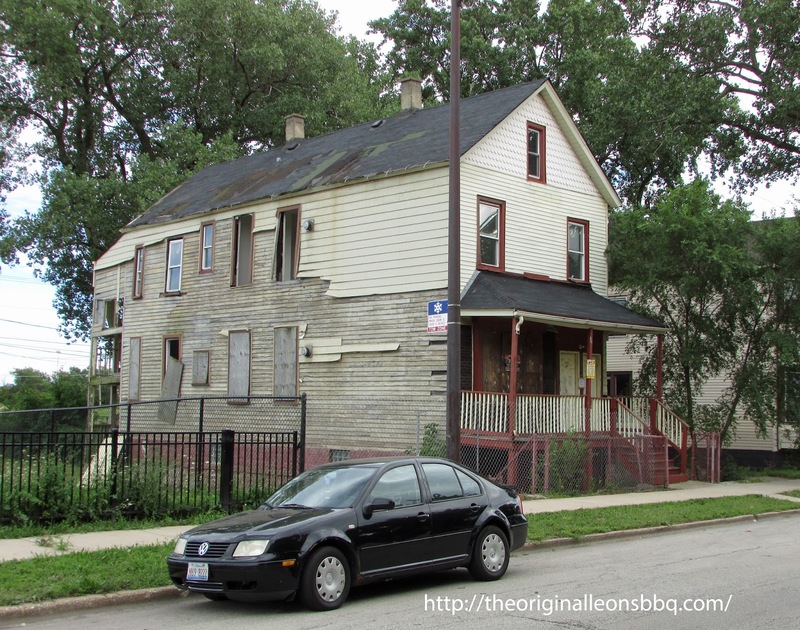 I like to call this very large house on the 9100 block of South Brandon--look how far back it reaches--a cadaver home. 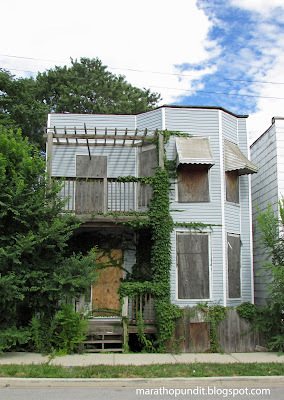 Think of this home as a corpse after medical students peeled away its layers. If you find yourself on the Chicago's Southeast Side and you have only a few minutes for urban exploration, then you must head to Mackinaw Avenue in the 8000s. There is a bounty of emptiness here. Yes, that's another "Red X" home. 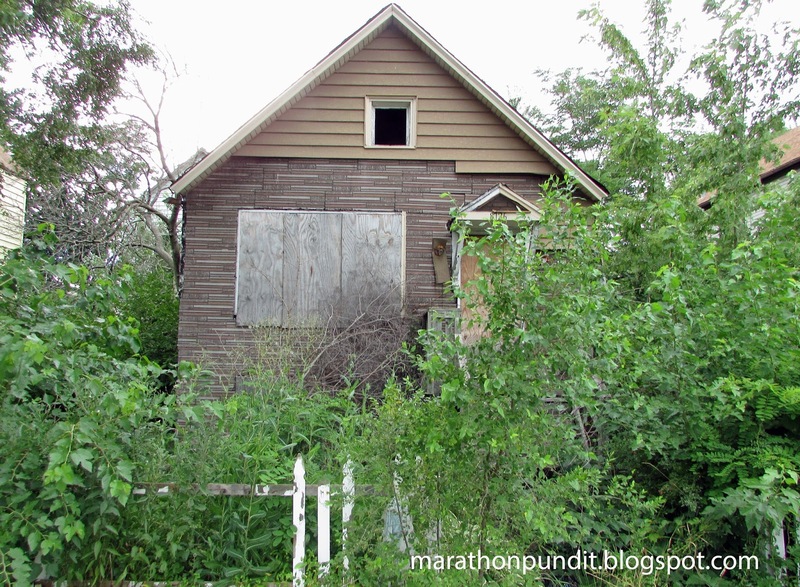 Here's a very common Chiraq site, a short walk away from that abandoned pair, a forsaken dwelling that has had its aluminum siding stripped by metal thieves. 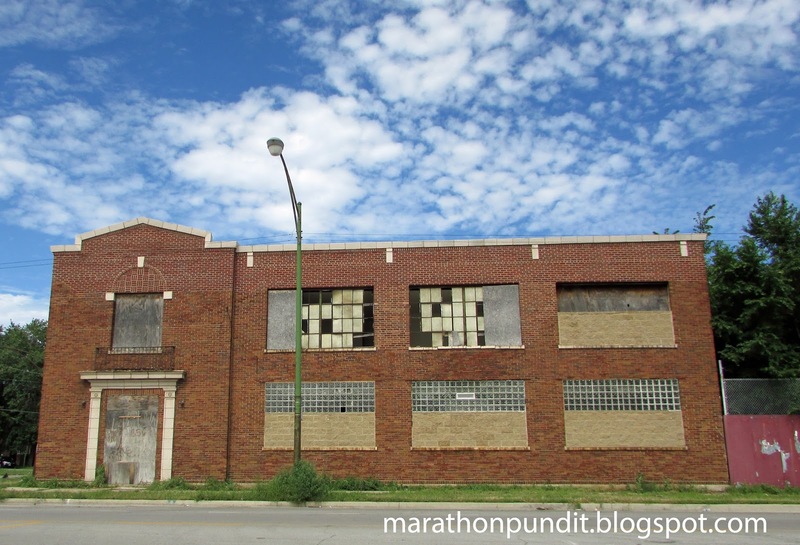 Here's an abandoned business on South Chicago Avenue. Well, at least the clouds are pretty. 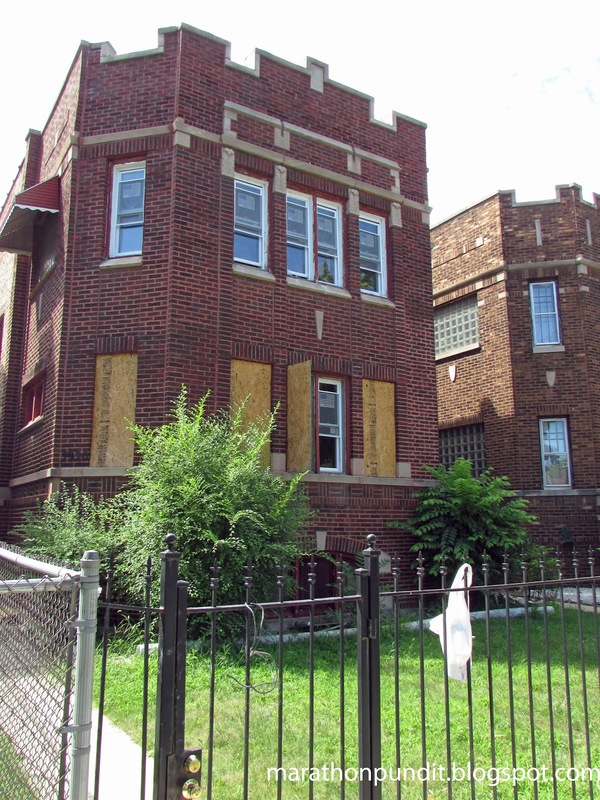 Up at 7918 S. Bennett you'll find this vacant brick two flat. 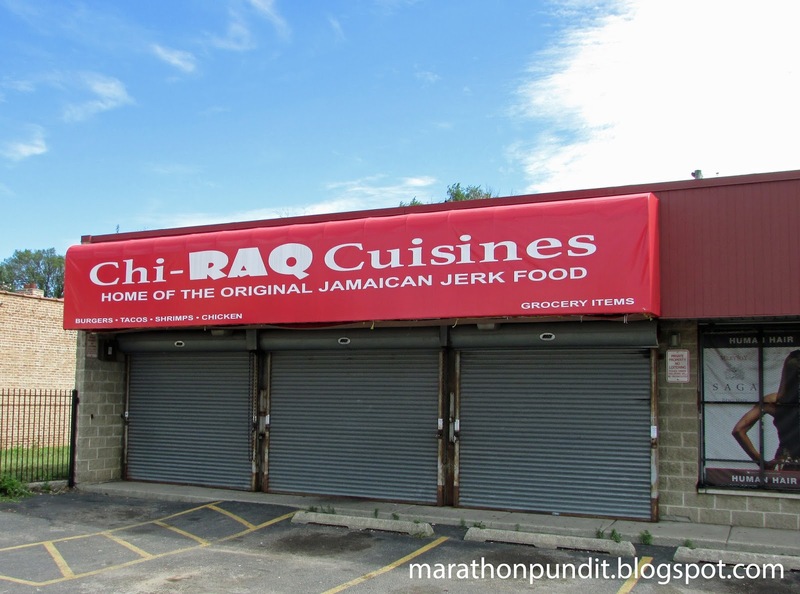 Around the corner on the south side of 79th Street is the provocatively named Chi-Raq Cuisines. Yes, it is still a going concern, despite its batten-down-the-hatches appearance. 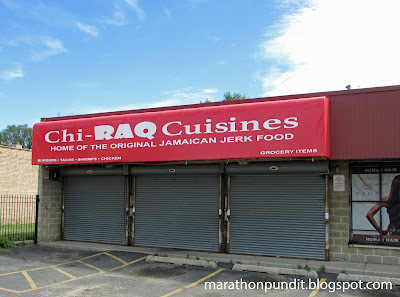 I visited on a Sunday, when the Jamaican food restaurant is closed. 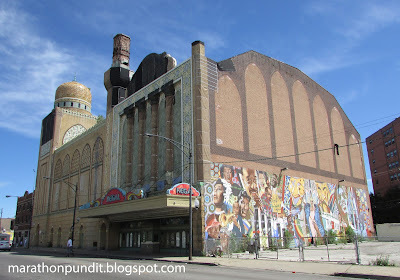 Drivers on the Chicago Skyway often mistake this building for a mosque, the error is understandable as the Avalon Regal Theater, which opened as the Avalon Theater in 1927, was built in the Moorish Revival style. My late father, who grew up nearby, saw hundreds of movies there as well as dozens of stage shows. Big movie palaces suffered when television sets became the focal point of American living rooms in the 1950s, but the Avalon was still a motion picture house as late as the 1970s. 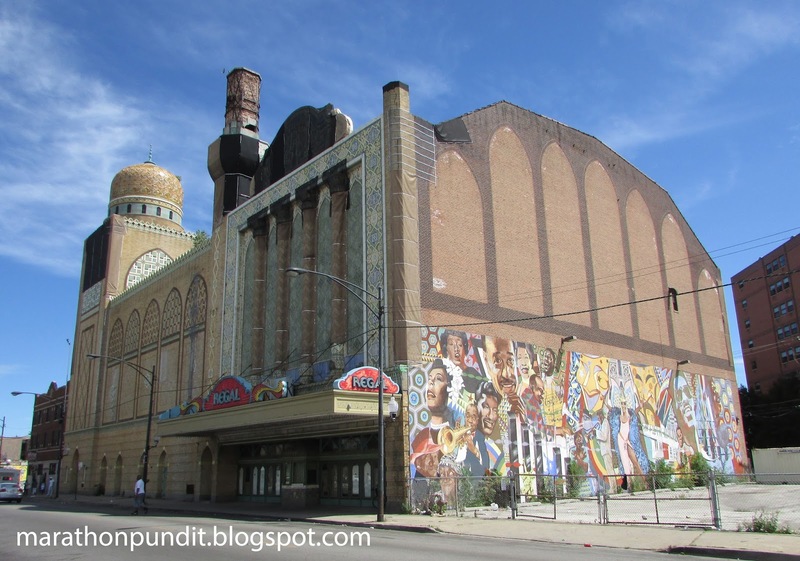 Then the Miracle Temple Church moved in; but in 1987 the Avalon, renamed the New Regal in honor of the original Regal in the Bronzeville neighborhood that was a premier entertainment venue for black performers from the 1920s until the late 1960s, became a live show venue. The mural depicts many of the Chitlin' Circuit era artists who performed at the old Regal. But by 2003 the New Regal closed. 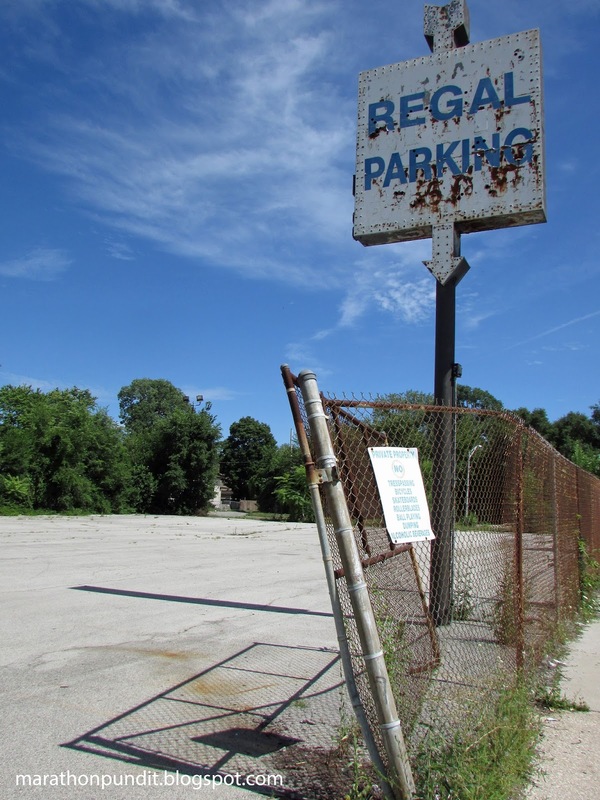 New owners tried to jump start the beauty, but in 2011 the theater went into foreclosure. It's vacant now. You can't see it from this angle very well, but there is a cottonwood tree growing on the roof. Lack of street parking undoubtedly led to the New Regal's demise. 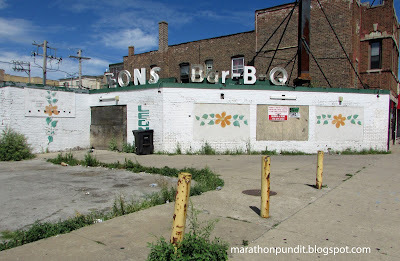 Across the street from the Avalon Regal is an abandoned Leon's Ribs restaurant. My guess is that Leon's tried to tie its fortunes of this outlet to the New Regal. Leon's still has two Chicago locations, it used to be a major presence in the city. Next: The Blogger Laureate of Illinois visits South Shore. I too, am on a "mission from God." So sad. Grew up on 76th.and Lowe before we moved to Beverly in the 60's. Oh how I want to go home. Just to drive by the old house and the neighborhood. Never going to happen now. It's a shame you can never go home again. I grew up on 105th and Lowe by Fernwood Park. I looked at my old street on google earth and was surprised to see that it looked OK. I lived in my great grandmothers house 100th & M (Eastside) that is what my family called the neighborhood as a baby. As a teen I loved visiting my cousins who still lived in the same house. We would go to Cal Park and jump off the rocks and swim, buy penny candy at the corner stores play games that they invented and just have a real good time. By the time I was in my 20's the neighborhood was already starting to go bad. 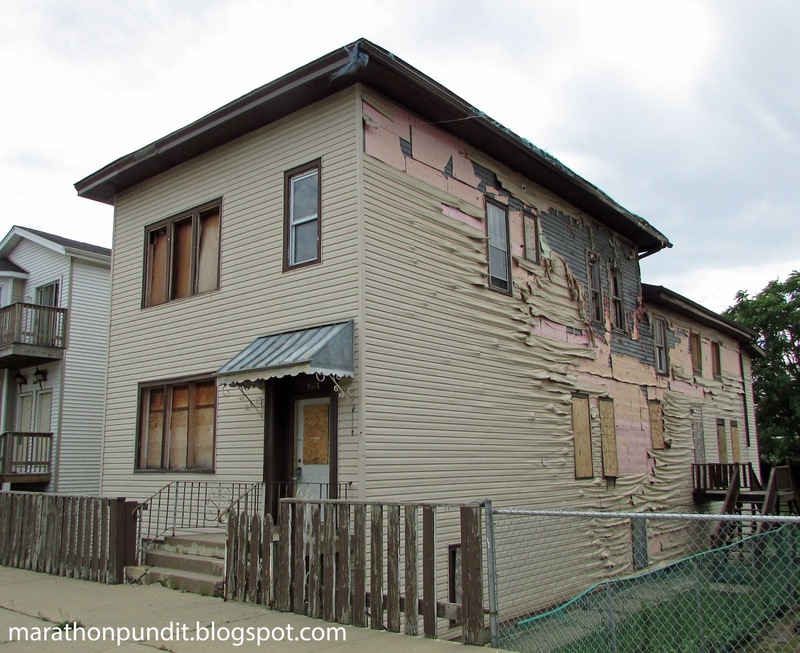 Democrats, turning every city into a Ghetto.